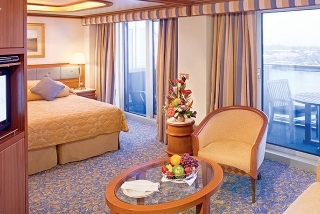 Elegant and comfortable, the Dawn Princess is a destination in itself, offering you everything you need to relax, rejuvenate and completely escape. The lovely ship has many exciting features, including the popular and innovative Movies Under the Stars, which provides a fabulous and unforgettable experience for everyone. There is also exciting entertainment, fun activities and a wide selection of fantastic culinary selections, ranging from casual fare to fine dining. 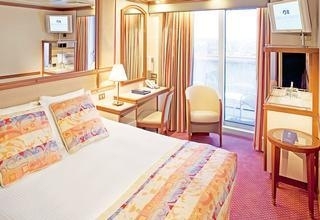 If you are looking for the perfect place for viewing the beautiful destinations, the lovely Dawn Princess, like her sisters, Sun Princess and Sea Princess, boasts more than 400 balcony staterooms. 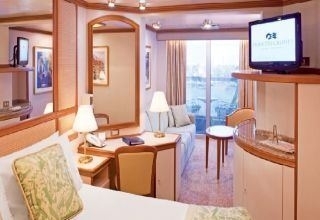 She offers everything from the 24-hour Horizon Court, to computerized golf, show lounges and a choice of sparkling pools. 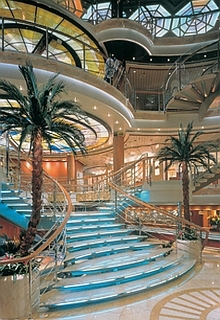 Highlighting the stunning ship is The Sanctuary, a tranquil haven in an outdoor spa setting. Providing the ultimate escape, this spa-like area is just for adults and allows you to indulge in a soothing massage at one of the cabanas and also enjoy a light and healthy meal. Other exciting amenities include three pools, fabulous entertainment and plenty of lounges, bars and eateries. More rejuvenating treatments are offered at the relaxing Asian-inspired Lotus Spa, which are sure to leave you feeling rested and refreshed. Keep up with your work-outs at the high-tech, glass-walled fitness center, boasting amazing views. You can also shop for duty-free items at the Boutiques, experience a Scholarship@sea enrichment program and enjoy yoga classes. As a member of the prestigious Chaîne des Rôtisseurs gastronomic society, Dawn Princess offers fabulous culinary creations from highly trained chefs. 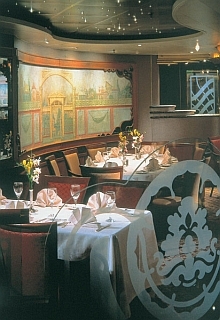 Dining venues are plentiful and diverse, including the elegant main dining rooms, Venetian and Florentine. With a décor of rich woods, etched glass lending an intimate feel and lovely murals of Florence and Venice, you will feel like you are dining in one of Europe's elegant restaurants. Savor beautifully presented and varied dishes, including vegetarian, from menus that change daily, as you experience a traditional fine dining experience at its best. Specialty restaurants include the reservations-only Sterling Steakhouse and Verdi's Pizzeria, where you can savor amazing pizza, made before your eyes, and enjoy classic Italian dishes in a lovely trattoria-like setting. Delicious freshly baked pastries and cookies are served at the Patisserie and the poolside Sundaes Ice Cream Bar serves a variety of frozen treats. Experience Ultimate Balcony Dining for an amazing culinary experience and experience the elegance of Afternoon Tea, offered daily. Feel like royalty as you are served scrumptious finger sandwiches, cakes, cookies and other treats by white-gloved waiters in formal attire. Whenever you get hungry, the Horizon Court and room service, have something for you 24/7. 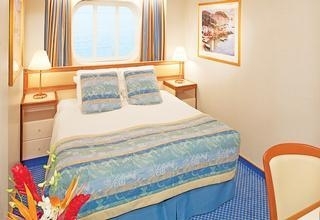 Select from a wide variety of stunning staterooms, including interconnecting Family Suites with balconies. 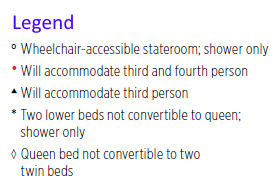 Expect the utmost of comfort as you relax in your home away from home. 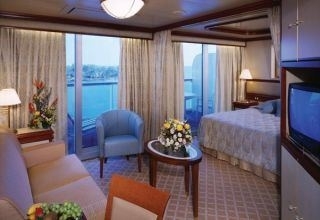 Many of the suites and mini-suites also have balconies, over 400 staterooms in all. 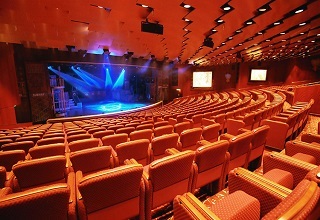 Exciting nights include Broadway-style shows and comedy acts at the stunning Princess Theater. Movies Under the Stars at the poolside theater features first-run films on a huge screen, a fun and unique experience for the whole family. 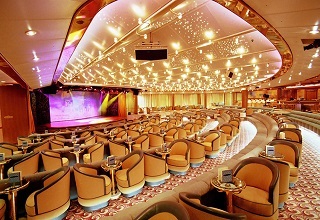 There are show lounges, a theater and dancing. The classic clubby Wheelhouse Bar has a nautical ambience and boasts ship memorabilia. 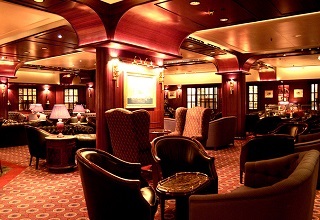 Cabaret-style entertainment is performed at the Vista Lounge. Try your luck at the Grand Casino, boasting more than 150 slots, plus roulette, blackjack, poker tables and other favorite games. Dance the night away at the Shooting Stars Nightclub. There are also youth programs for both kids and teens available. 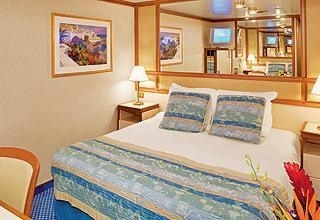 Dawn Princess is based in Australia and cruises to such destinations as Australia/New Zealand, South Asia, South Pacific Island and other World & Special Cruises. Outdoor BBQ serving hamburgers, beers and sodas on the open deck. 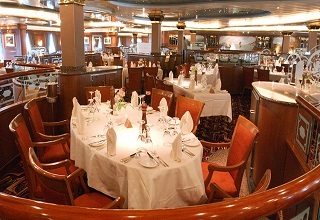 One of the two main dining rooms, this room features a unique asymmetrical design and intimately-designed seating areas. With its etched glass, granite borders, decorative light sconces and rich wood tones, it exudes ambiance and charm. 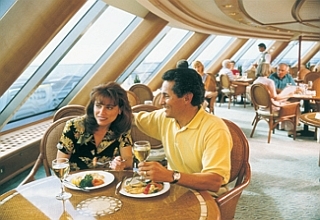 This 24-hour cafe features a light buffet menu as an alternative to a more formal meal in the ship's dining rooms or allows passengers to indulge their snacking urge any time of day. 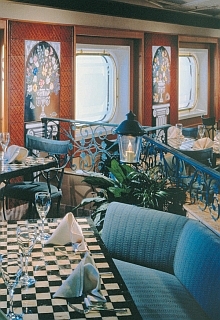 With a 270-degree view over the prow of the ship, the cafe features indoor seating and an evening entertainment area with a dance floor and bar. Princess' trademark pizzeria features a contemporary "winter garden" feeling with decorative wrought iron work, hand-painted tiles, flagstone floors and checkerboard marble tables. Pizza making becomes an event as passengers can view the process through a large picture window. Located off the Grand Plaza, the Patisserie is the place to relax over a cup of cappuccino and a freshly-baked pastry. 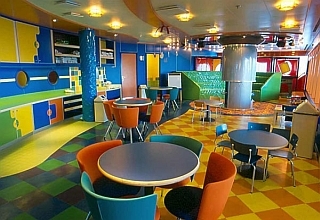 Located directly above the ship's other dining room, this space is identical, except for color scheme. 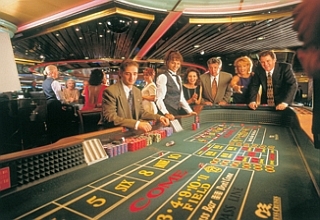 The Grand Casino has over 150 slot machines and blackjack, roulette and poker tables. One of the unique features of the room is its stained glass ceiling sculpture which simulates a moving roulette wheel. A classic Broadway theater with pillar-less, unobstructed views, this is the venue for exciting evening entertainment featuring Princess' award-winning shows. Features traditional theater-style seating, a full 36-foot-wide proscenium arch stage, and rich, art deco decor. This wood-paneled library has a comfortable "old world" feel and features private reading chairs each with its own bay window view. This richly-decorated room has a "King Arthur's Court" feel with dark mahogany, a specially-designed chessboard carpet and leather furniture. Card and other games can be played here and it can also be used as a meeting room. 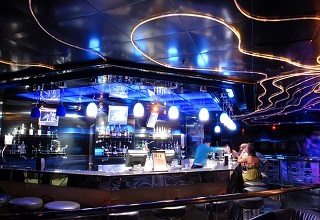 State-of-the-art sound and lighting equipment, a dance floor built over video screens and in-port dancing on the deck outside make this disco/nightclub the center of late-night action. 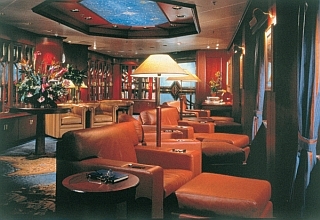 The business center allows passengers to conduct business at sea, and features three IBM desktop computers with CD-ROM capabilities, one MAC computer, a laser printer, color printer, fax modem and a variety of software. 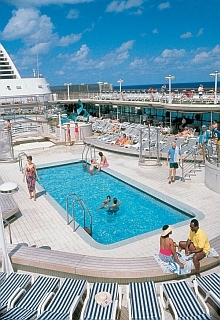 A dramatic partially-shaded pool with two whirlpool spas appears suspended between two decks with its surface between the health club and the Sun Deck above. 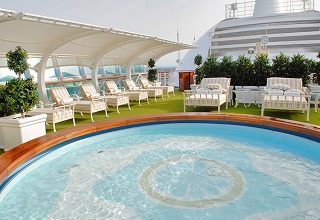 The Riviera deck boasts two large pools, two whirlpool spas, a waterfall, a band stand, and island bar, "Sundaes" ice cream kiosk, and deck chairs. This computerized golf center gives passengers the opportunity to enjoy simulated play on many of the world's top golf courses. Two age-specific youth centers to help make Princess an ideal family vacation. The Fun Zone for toddlers features a splashpool, castle, doll's house, children's theater and ball jump. The teen's center takes teens to the limits of their imagination with video games, refreshment bar and teen disco. A full-schedule of organized activities is offered in both areas. A duty-free gift shop offering fragrances, evening wear, fine jewelry and collectibles in a romantic setting. 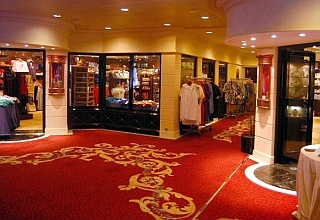 A duty-free gift shop featuring novelties, sundries and cruisewear fashions, using ceiling moldings, armoires and warm woods to create a European flair. 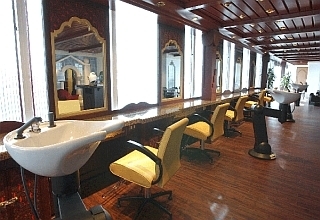 The beauty center offers a full array of men's and women's hairstyling, facial and personal grooming services. Featuring "fitness with a view," this spa includes a glass-walled high-tech gymnasium, health center and aerobics area, which not only look outward towards the sea, but wrap around the pool and outside terraced seating. 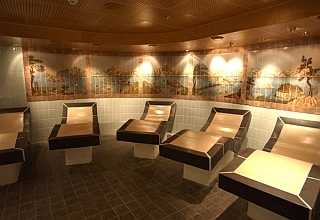 The area features saunas, as well as 11 rooms for massage and other treatments. Champagne, wine and caviar bar serving a variety of domestic and imported wines and champagnes by the glass, plus a selection of imported caviars and other beverages. An outdoor aft bar overlooking the activity at the spa situated below. Modeled after the officer's bar of yesterday's liners, the Wheelhouse Bar features lots of brass, leather furniture, rosewood-paneled walls and a collection of ship memorabilia which give it a classic, nautical feel. An outdoor top-of-ship bar serving a wide variety of refreshments to thirsty pool-goers and sun bathers. The intimate Atrium Lounge boasts a beautiful dance floor, bay windows, and views down into the atrium and up to the pizzeria. One of the two main showrooms, the aft Vista Lounge offers cabaret-style entertainment viewed from tiered seating, and surrounded by ocean views through floor-to-ceiling windows. A cozy sit-up bar, and a stage that turns into a dance floor will make this a popular evening spot. 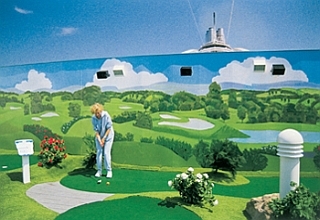 A top-of-ship paddle tennis court, which can also be adapted for other games such as volleyball and badminton, is uniquely-located in the ship's funnel structure. 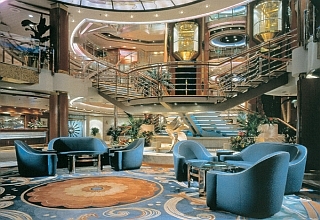 The four-story Grand Plaza atrium is the main social hub of the ship with shops, entertainment and dining radiating from this focal point. It features a 24-hour reception desk and circular marble foyer, glass elevators, a circular floating staircase and stained-glass dome. 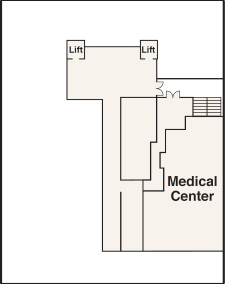 A second smaller atrium is located aft of the Grand Plaza.